Datacenters may be physical or virtual and are the backbone of cloud computing. They are used to house groups of networked computers that require a lot of power to store, process and or distribute massive amounts of information. The information that they store is accessed daily by our computers and smart phones. Up until now they have been built on land but Microsoft researchers believe the future of datacenters may be under the sea. Sean James, a former submariner now working for Microsoft on a research team, was one of the authors of a paper that suggested the possibility of placing datacenters underwater. “What helped me bridge the gap between datacenters and underwater is that I’d seen how you can put sophisticated electronics underwater, and keep it shielded from salt water. It goes through a very rigorous testing and design process. So I knew there was a way to do that.” The special projects team at Microsoft took the idea and ran with it. Thus, Project Natick was born to manufacture and operate an underwater data center. 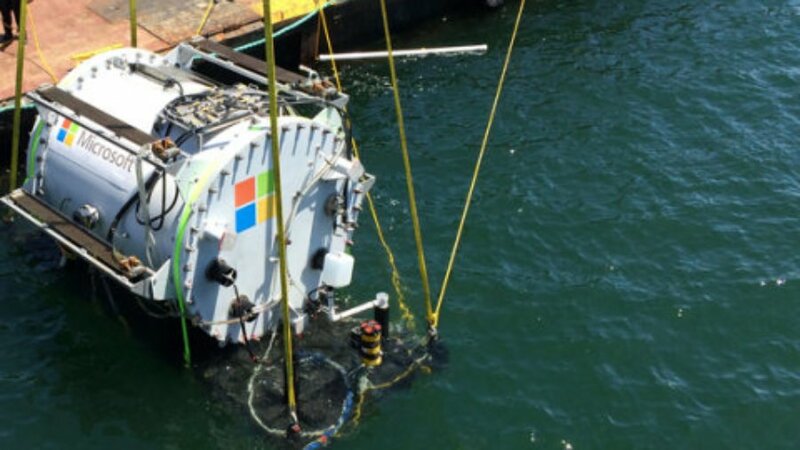 In August 2015, Microsoft deployed its first underwater datacenter housed inside a 10 by 7 foot container vessel named the Leona Philpot, a character in Microsoft’s “Halo” video game. It was deployed not too far off the coast of central California so they could hook into an existing electrical grid. It was hooked up and running in one day. A diver went down once a month to check on the vessel, but otherwise the team was able to stay constantly connected to it remotely. The vessel was retrieved in November after having been underwater for 100 days. The team is still analyzing data from the experiment but so far the results are promising. Project Natick may be the answer to Microsoft’s ongoing quest for cloud datacenter solutions that offer rapid provisioning, lower costs, high responsiveness and are more environmentally sustainable. Microsoft says the underwater datacenters might be able to utilize a new power source, (wave or tidal power) and reduce cooling costs and emissions by taking advantage of the lower surrounding temperatures. An underwater capsule can be built and deployed within 90 days. A Project Natick vessel could be dropped off the coast of a disaster zone to enable faster access to data. Since about half of the world’s population lives within 124 miles of the ocean, placing datacenters offshore brings them closer to more users which makes the time it takes data to transfer from a server to your computer or smart phone go down dramatically. The Microsoft team is currently planning the project’s next phase, which could include a vessel four times the size of the current container with as much as 20 times the computer power. The team is also evaluating test sites for the vessel, which could be in the water for at least a year, deployed with a renewable ocean energy source.